Janome’s mission is to produce machines that inspire creativity and innovation, yet are simple to use. The most important thing about their products is not the machine themselves, but what you create with them. The better your tools, the more inventive, artistic and pleasurable your sewing experience. That is why Janome sewing machines are designed not only for performance, but also for comfort, quality, and intuitive ease of operation. This same thought process is also brought to the creation of their accessories. These specialized tools allow you to get more out of your sewing machine, and to create advanced results to make your sewing more enjoyable. As a leader in the sewing industry, Janome keeps striving to provide best-in-class products and services which enable sewists’ creativity and innovation. They are constantly working to develop products and accessories to make your sewing time more fun and rewarding. At Janome America, they create products to inspire, not intimidate – because the most important function they perform is to set your creativity free! The first step in cultivating your sewing skills is choosing the right tools. Let the Janome Video Tutorials guide you for the projects you have in mind and serve as an inspiration for new ideas. Available on your computer, laptop and NOW a web app for mobile devices! Janome heard over and over again, everyone loves video techniques. Learn how to use the presser feet that came with your sewing machine or techniques with new feet by going to Janome Video Tutorials! These short, helpful segments, produced by Janome America’s own Education Department, prove that if a picture is worth 10,000 words, a video must be worth 20,000! Janome is proud to offer a web app for mobile devices. 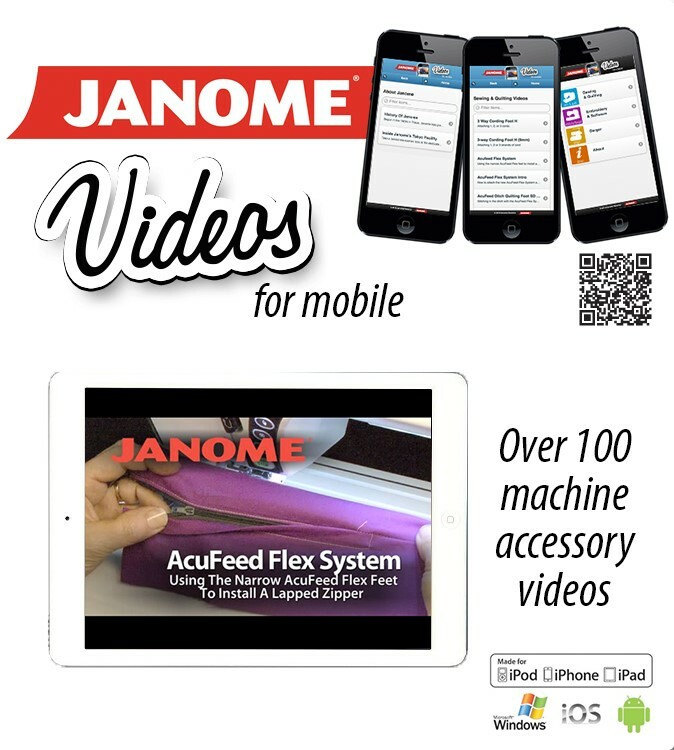 The Janome Videos app gives users direct access to over 100 machine accessory videos. Each video details the proper use and application of sewing machine feet and accessories. The video app is compatible on iOS and Android platforms. For instructions on how to add the launcher icon to your home screen click here . Start enjoying the Janome video app on your mobile device now! A wide selection of embroidery design software collections from Dakota Collectibles, the World’s Largest Supplier of Stock Embroidery Designs is now in stock. Quantity Pricing on Individual Designs Select from a library of over 20,000 designs. If you need a design collection that we do not have, want an individual design or want to order from the QPID program go to www.gonutsgocreative.com and use the Red Barn Sewing & Yarn Center’s Go Nuts Number 2837.